A Three-Pound Monkey Brain: PhyloPic Launch: API, Responsive Design, etc. PhyloPic Launch: API, Responsive Design, etc. How smartphone users should see PhyloPic, more or less. Responsive design (using the ever-more-ubiquitous Bootstrap) — the site is now much more useable on mobile devices. 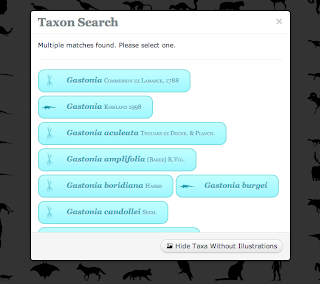 A Links Page, showing off work that uses PhyloPic or features it in some way. Speedier load times (in theory, anyway). Ranks for Contributors — if you submit one image, you're a "Specialist". Two, and you're a "General". Six, and you're a "Familiar". See where this is going? Fewer requirements — most notably, Flash is no longer required to submit images. Yes, I know the plant doesn't look like that, but at least you can tell it's a plant. We'll just have to wait for someone to illustrate it properly (*cough cough*). Some image files (notably certain PNGs) can't be uploaded right now. Try TIFF (or better yet, SVG, if you possibly can) until I can address the issue. Enjoy! If anyone needs me, I'll be grilling some lamb.